Don’t bring a bottle of wine over to your newly sober friend’s house, when they invite you to dinner. I am just being silly — everyone has their own comfort level. Some people don’t allow alcohol or drugs anywhere near them, others don’t care at all. In general, it’s always safe to be mindful of sober people during the holiday season. When in doubt – ask questions like “there is going to be booze at our party, will that be an issue?”. Frankly, when I was newly sober, I was somewhat insulted by that question … now I am flattered. To be safe just ask, because there is a “gray area”. Some recovered alcoholics drink non-alcoholic beverages. Personally, I find that crazy, but that is my opinion, not an official rule. Side note: I severely offended someone once, by telling them that non-alcoholic beverages were meant to be drunk by non-alcoholics. I don’t say that anymore, it’s none of my business. The exception is if the person is under my care or asks for advice. My modus operandi – I go to parties where alcohol is served when I have a valid reason to go. I always drive my own car, I don’t stay too late and I don’t judge what other people are doing. I am not against drinking. It is perfectly fine for people who can handle it. That does not apply to me. Sober Holiday – Amazon has some sober clothing options. That makes for a fun light-hearted gift. When I arrive, I ask for a soda or water. I don’t put down my drink and I don’t drink anything, that could accidentally the wrong beverage. My level of alcoholism requires vigilance. I have a zero tolerance allergy, and I don’t want that “craving” to kick in. Purchase movie tickets or a Netflix account. If you do, I have a list of films about addiction (if you are weird like me and like that kind of films). Recovery Coins and Medallions make a great stocking stuffer. I buy mine at Network 12 “Your Internet Supermarket for Recovery Medallions”. This is a no-frills site, that offers a wide variety of sobriety coins. They have a beautiful selection, reasonable prices, and good customer service. I have ordered from this site dozens of times and always have had a good experience. By the way, the item arrives in a discreet package. Splurge on a Sober Vacation (if that is in your budget). SVI Sober Vacations International “SVI was created in 1987 with the idea that recovery has to be fun. Anywhere we gather to have a vacation with meetings will be great. We try to find that special destination that takes this idea to the highest level.” We have been on dozens of vacations with this company. They provide a wonderful, sober experience. It’s great for families, singles, and couples. It’s also a nice way for someone to travel alone. Many of our vacations have been at Club Med. The entire village is typically booked for SVI and all alcohol is removed.Speaker Tapes. Google Play or iTunes gift cards make great presents. Did you or your sober loved one get a new device this year? Take advantage of the latest technology by incorporating some smartphone apps into sobriety. I have recovery app suggestion listed in another article. For recovery inspiration and links – Follow me on Twitter. meetings. It’s easy to navigate, no-frills site. They offer all sorts of recordings from conventions, workshops, and speaker meetings. All of the speaker tapes are put online as a free download. I have been using this site for years. AA Speakers This website contains a collection of over 300 Alcoholics Anonymous speaker tapes. All of the speaker tapes are free. You can listen to them online or download the mp3 speaker tapes to your computer. I have also been using this site for many years. There are also dozens of recovery podcasts and even YouTube channels available, for your sober listening pleasure. I tend to keep it simple and use the sites just mentioned. Is your workload “light” this week? Ours is. Nothing says family fun entertainment more (in our house) than watching movies and television. Sure, we have a seven-year-old, but when he is asleep, we turn off Frosty the Snowman and watch the most dysfunctional themed entertainment, we can find. Those are my holiday suggestions, what are yours? The holidays can be a time for family gathering and joyful celebration. However, if you have dysfunction in your family (combined with an addiction problem) these times can be stressful and lonely. If you are newly sober it can even trigger for relapse. For folks who are new to recovery and even those with a little sobriety “under their belt”, it’s important to be prepared. Be ready for some problems and emotions that will almost certainly “pop-up” during the holidays. Don’t fret, you can learn how to recognize relapse signs and stop destructive behaviors. You can learn to avoid situations that could result in relapse. Noticing the signs of a relapse is important for a recovering addict. The signs of “old behavior” can appear in thoughts or actions. It’s important that you know your own personal sensitivity points and avoids anything you think may sabotage you. If you can’t avoid certain emotions or places, have a sober friend join you at social gatherings. You may want to skip occasions where alcohol or drugs may be present. Even if you don’t think it will be a problem, it’s still better to plan ahead of time, just in case you feel uncomfortable. Remember, no occasion is important enough to give up your freedom. Staying home is always an option. Addiction is a recognized disease. It’s not longer considered a moral failing or a lack of willpower. If it’s appropriate, you might want to just be honest with the people you trust. Most people will understand and be more than willing to help. You will learn who your true friends are and find the people who have gone through addiction treatment themselves; they will want to help. Remember, you need to develop a support network and know who to trust, in times of need. I always ask to have my wine glass removed when I am seated at a table like this. If that’s not practical, I turn the glass over. Make plans with friends and family so that you are not alone during the holidays. Research has discovered that the people who have more social interactions and connections have stronger immune systems, a longer lifespan, and a reduced risk of stroke. It is also beneficial for you to spend a bulk of your time with people who are sober, both at meetings and outside them. At each party or gathering you attend, be sure that you have a way to leave early. Being stuck somewhere there is likely to be drunk people and alcohol isn’t a good idea. This is true especially for someone in addiction treatment or newly sober. Even for people with a lot of sobriety, this can be challenging. This is an easy way to block people from pressuring you to drink or ask why you are not drinking. Too much pressure can lead to a very uncomfortable situation. Practice a quick and straightforward response ahead of time. This will help you to quickly move on to a different topic of conversation. It can be something as easy as, “I’m not drinking tonight”. If you rather avoid talking about it all together, you can say you are the sober driver or that you are on medication that is dangerous when combined with alcohol. This is important if this is your first holiday in sobriety. Concerned family members may have caring questions, but others may seem as though they are deliberately trying to put you down or make you feel uncomfortable. Practicing answers to these types of questions with a trusted sober friend is a good method of preparation. There’s nothing wrong with just not answering a question you are uncomfortable with. Be happy and positive — addiction treatment during the holidays can be a powerful way to begin a new year, create a new you, and build a new life. If you are abusing drugs or alcohol. There is a good chance, you will get in trouble behind the wheel. A DUI can cost you your life, and up to $20,000 when you add up all of the fees and legal expenses. Buzzed driving is drunk driving – just because someone may have had only one or two drinks does not mean they are OK to drive. Consuming alcohol can impair judgment and make people less likely to make the best decision for the safety of themselves and others. As a result, they may think they are OK to drive when they are not. Alcohol slows a driver’s reaction time, reduces their ability to properly gauge speed or distance from other objects and makes it difficult for them to focus on the road. Sometimes, one or two drinks are all it takes to impair someone’s ability to drive. Alcohol steadily decreases a person’s ability to drive a motor vehicle. The more you drink, the greater the effect. Planning ahead for a sober ride is the best way to ensure you get home safely. Don’t wait until after you have started drinking. Designate a driver or arrange for someone you trust to pick you up. That also applies to others you know. If you know someone who is about to drive impaired, take their keys and find them a sober ride home. You can go to Sober Rides for assistance. You’re not alone if you’re not exactly feeling in the holiday spirit this year. Too many crowds, too much Christmas music, too many family obligations. You eat and drink like there’s tomorrow, but then have to wake up the next morning anyway. It can all be a bit too much. The holidays can get us down, but we can also fight back. So how exactly do you fight back? You can kick the holiday stress by doing as much planning as possible. Plan your time with extended family, plan who’s cooking what day, and where you need to be on which day. The more you schedule things (and stick to that schedule! ), the more likely you won’t be stressed out by having to make a dozen last-minute decisions. Don’t put off using them because “there’s no time,” or “I have to be there for others.” You can’t be there for others if you don’t take care of your needs first. It’s easy to go overboard with everything during the holidays. We tell ourselves, “Hey, I deserve this” or “One more helping won’t really hurt anything.” We feel like it’ll help the stress if we have one (or two, or three) extra drinks to help deal with our family. But overdoing it rarely helps anything, and makes us feel worse in the long run. Yeah, it’s a pain to stick to eating a healthy diet and not over-indulging during the holidays. So do this instead: allow yourself one extra helping at one meal a day, or one extra dessert. Giving yourself an allowance for a little extra ahead of time can help you keep to reasonable limits, while still allowing yourself to enjoy the holidays. Now’s not the time to start a new diet, a new routine, or try out a new personality. Sticking to what’s worked in the past is usually best, with a few little tweaks here and there to help make things even better. You can, of course, always try and change things for the better. But it’s wiser to do so in little bits and pieces, not all at once. Want to improve your relationship with a family member? Take baby steps to work on more clearly communicating with them without snark, sarcasm, or bringing up past embarrassments or hurts. Actions speak louder than words, so no need to tell others you’re working on improving these things — just do it. It may also help to give yourself some alone time after interacting with a particularly unhelpful family member. Excuse yourself and go for a nice brisk walk outside to help clear your head and re-establish your calm. Need More Holiday Sobriety Help? 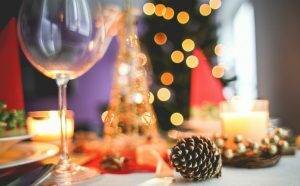 They got you covered with our annual, updated Coping with the Holidays Guide, a survival guide that is chock full of dozens of articles to help you with specific concerns, situations and issues. Check it out (and please share with your friends and family if you think it may help them too)! Fantastic post. And you were right. Near-beer, near death. The fool who was offended will eventually go back to drinking. Rarely have we seen a person fail who throughly followed our path. I’ve seen thousands fail who didn’t. Oh that is so original- I never hear that near death slogan. Brilliant! We call a buddy of mine Near-beer because he used to be one of those. Took him a relapse to get it. Wonderful post. I’m a pretty introverted fellow who doesn’t attend a lot of parties (but the ones I used to get roped into going to had plenty of wine and beer, which was the only thing that made it tolerable then), but my new life in sobriety might very well lead me to these situations. I’m trying to be open to new things, so thanks for the tips (and NA beverages terrify me…too close to the real thing). I love the line “My level of alcoholism requires vigilance.” Boy, that’s the truth about mine, too. I am glad that you related to my experience. Please come back and visit again. Thank you for this! My husband is fresh out of rehab, and we are preparing for the holidays. Great resource. Very useful post. Sometimes at work parties it is hard to “out yourself” as an addict. I usually just insist that I am mormon or muslim or something. I am the wife of a recovering alcoholic. We are reuniting as a family. This post helps me tremendously with some of my concerns about socializing with family and friends. Thank you!! Davina that means so much to me. Funny timing … We are on a 14 day driving trip and our vehicle just broke down. Thanks for the smile. I hope all has worked out with your vehicle – sending positive thoughts your way! Enjoyed reading this, good suggestions. Great suggestions for the holidays, and I love the snow animation on your blog! Happy holidays to you and yours. Thanks Victoria. We share the same name, so I like you already. Great comprehensive thorough post. Well done! Great article! Always a good idea to be more aware of, and more prepared to deal with some of the things that are unique to the Holiday season! I’d also like to thank you for being the very first person to post a “like” to my first article on my first blog ever! I’m a new follower, and I really like your writing, and what you and your husband are doing. Quite an inspiration! What an honor to be your first. Thank you for that. I would like to be your follower too! Just have to accept the family habits. At least my daughter and granddaughter support me. All the best to you and yours. My sober husband accidentally “chugged” a rum-laced diet soda. It was a hot day and he was super thirsty. He ordered it at a small lunch spot, so he was completely innocent (it’s not like he was at a bar). However, he said it felt nice and warm going down and it caused a craving. That is a big fear of mine. He did the smart thing and immediately sought out support from sober people. Thanks Rob it’s always nice hearing from you. Are you still at the VA? Do you consider guest posts? A sad or lonely holiday can be very traumatic. I appreciate your candor and I’m glad to see you focus on the solution, rather then the problem. Do you have a support group or friends to help you, during this time of year?